MegaSites are massive websites with 10,000 to 20,000+ individual pages that we build, own and maintain in hundreds of local markets. Each page is fully optimized to rank on the first page of Google for highly targeted search terms. Buyer search terms! We understand it's difficult to immediately grasp the idea of a website with tens of thousands of pages, let alone ranking THOUSANDS of those pages on the first page of Google. The concept is not new. But until recently, only large companies with deep pockets could afford it. In early 2016 we pioneered scaling the strategy to the local small business market. Converting MegaSites to a leased product completed the picture by adding affordability to the success formula. Continue reading to learn more and be sure to contact us with questions and live proof of MegaSite rankings. Why do I care about Google and MegaSites? 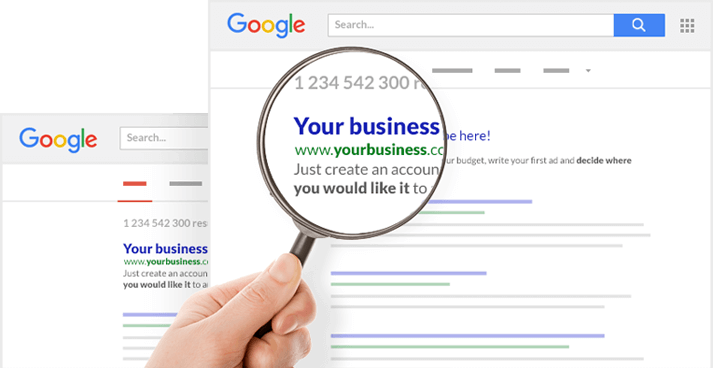 Website pages that rank at the top of Google are like billboards but way more valuable because they appear precisely when people are actively looking for that product or service! Real time advertising to the perfect prospect! 20,000 MegaSite pages are like 20,000 targeted, powerful billboards! MegaSites puts your company in front of the masses of people actively searching Google for exactly what you can provide them! The importance and effectiveness of this can not be overstated! When prospective customers find you repeatedly listed by Google your online credibility skyrockets and you will see the results in more calls, more sales and more bank deposits! What is different about the MegaSite process? We start with proprietary research tools that tell us exactly what people in your area type into Google when searching for your services. These search terms are the keyword phrases we begin working with. We then identify your market in geographic terms – usually a 25 to 35-mile radius, and collect all cities, towns, suburbs and zip codes and combine the data with all of the important keywords into a MegaSite with thousands of combinations and highly targeted pages – which Google loves! – and rewards with Page One ranking! All the attention from Google is directed towards our MegaSite. Using technology that is unlike anything else available, we then seamlessly redirect all the Google search traffic to your website. We never touch your website – we just open the traffic flood gates for you. You may have guessed by now that building, hosting and maintaining a MegaSite of 10,000 to 50,000+ pages can be a full-time job requiring special expertise. For that reason we retain full ownership of the MegaSite and offer it as a leased service. No management problems with all of the benefits! We have great confidence in the results we deliver and require no long-term contract. All MegaSites are leased month-to-month. If our service does not fit into your overall business plan as expected the lease may be cancelled at any time. If for any reason a month-to-month lease is cancelled we repurpose the MegaSite and redirect all web traffic to another business in the same business category and geographic region. What about exclusivity for my service area? We lease a given MegaSite to only one business in a geographic region per business category and will not build a second site in the same region for that category. For example, if there are 28 martial arts studios in a 30-mile radius, we will build one martial arts MegaSite and lease it to only one Dojo in the region. A MegaSite that ranks thousands of search terms on Page One of Google is an extremely valuable asset due to both ranking and exclusivity. Simply stated… Your MegaSite is exclusive to both you and your geographic area. We build MegaSites to help our clients and to build long-term relationships. We do not build competing MegaSites. Is MegaSite part of a long-term strategy? At iDigital Promotion every step we take has one eye on today's work and one on tomorrow's pathways. With our goals clearly built around long-term client relationships we over deliver in ways that will surprise you. For starters, we list your business on all important online directories (70+) including Yellow Pages, Yahoo Local, Bing Local, etc. We do so using consistent data sets so Google sees you as a serious player. Since it’s an important business strategy to show positive customer feedback… We provide a customized online dashboard and full access to an entire autopilot Customer Feedback Suite that includes full social media syndication to automatically share the positive comments about your service on Facebook, Twitter, Google+, etc. …and way more than we can explain here. Let’s just say we have strategies in place to continually build your business’ online success. Most companies struggle to appear on the first page of Google for just a handful of keywords. We consistently rank thousands of relevant keyword terms on Page One of Google for our clients! We can do it for your business! And we do it without touching your current website. In fact, you don't even need a website! Order MegaSite below or Click to Schedule a call to answer your questions. Complete keyword research including category and local geo modifiers and LSI data. Compile required site components including images, videos, content and local resources. MegaSite size is dictated entirely by the number of keywords and the geographic area targeted and is not limited. Includes additional content pages dictated by new ranking and keyword intel, trends or requested by Client. MegaSite is indexed and linked on category focused Web 2.0 Blogs and Profiles, Social Bookmarking Accounts, Wiki Directories, Article Directory Accounts and others owned and maintained by iDigital Promotion. Redirection can be segregated and may include redirection to one or more Client webpage as strategy requires. We are currently waiving our setup fee! Secure your $600 fee waiver by scheduling an appointment! Nothing to lose and $600 to gain! MegaSites are custom built to careful specifications involving your product or service keywords and the size of your geographic market so ‘one-price-fits-all' just doesn't work. Schedule a free consultation and we will design a workable, cost effective plan to dominate Google search results for your business. All calls are FREE with no obligation of any kind. And there is no such thing as a silly question! Schedule a call and talk with one of our in house technicians. You'll be glad you did! You will REALLY be glad you called because we are currently waiving all setup fees – a $600 savings! Don't miss the special promotion! It won't last forever!